There is a good book called “ The Five Love Languages” which I recommend. My husband and I read it together long ago. It turns out that our love languages are very different and this understanding helped us. One of my primary love languages is gift giving. As such, it is hard for me to understand people who say they cannot figure out what to give. My problem is editing my gift giving plans. This post is approximately 25 days until Christmas. That, in my mind, is enough time to come up with several clever, inexpensive gifts… Homemade gifts… before Christmas. I am taking a stand here and recommending that you consider home made gifts this year. You could save money, and really touch the heart of the recipient all at the same time. You may assert, and I have heard people say, that they have no artistic talent. This just hurts me to hear, as I believe it to be uniformly false, and one of the worst forms of self talk. I think with the resources that we have these days, Pinterest, magazines, and the internet at large, there are instructions for everything. Pro tip: Search " best DIY gifts". The key is to keep it simple and heartfelt. The other key is to stretch just a little each time, and you will learn more and more. Pretty soon you will be making stained glass windows. Be kinds to yourself and keep your sense of humor. Prepare your time, your workspace, and your supplies before beginning. Read through all the instructions first ! Be prepared to goof up and fix things. Consider the pros and cons of doing it yourself, versus together with a supportive friend. Here are a few ideas for categories of home made or home assembled gifts. You know your own skill set and will be prepared to build on it. You also know your recipient. Trust yourself and move forward. Themed gift baskets and “kits"
cooking themes; Try going by country, i.e. Italian, French, Mexican, Cajun, Japanese, etc. Don’t worry if your gift is not perfect. Just take care that it reflects the connection between you and the recipient. Making and giving is a soul growing exercise. Give it a go this year. As most of you know I recently returned from my alma mater, nerd nation, the mothership, Stanford University. Here is a group of misfits so diverse and enthusiastic that they just might save the world. Nerd (adjective: nerdy) is a descriptive term, often used pejoratively, indicating that a person is overly intellectual, obsessive, or lacking social skills. They may spend inordinate amounts of time on unpopular, obscure, or non-mainstream activities, which are generally either highly technical or relating to topics of fiction or fantasy, to the exclusion of more mainstream activities. Interest in the fine arts, non-mainstream music such as classical, progressive rock, techno, or folk music, hobbies (i.e., collecting), or other "obscure" interests. Heavy obsession with a topic that would otherwise be mainstream (such as a popular TV show or a sport). 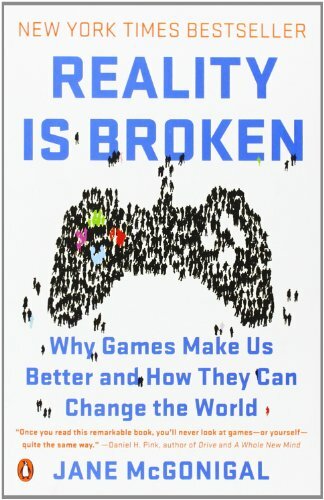 Jane McGonigal writes convincingly in her book “Reality is Broken" that the gaming community is full of people with great capacity to focus, as well as a passion for adventure and righting wrongs. She proposes to harness this energy for good and not just for gaming. This nerdy passion for adventure and justice combined with an intense capacity for focus was just what I saw at Stanford. I returned from nerd nation inspired and encouraged. However I also found myself with a number of questions. Have I had enough faith in myself and the world? Have I tried enough new things ? Have I developed myself to my fullest potential? Have I done enough to make the world a better place ? There is the temptation for these questions to become very heavy. However, in nerd nation, there is the acknowledgment that everyone is unique and that everyone has something unique to contribute. It was provocative nonetheless to meet a considerable selection of people who are doing things that could actually change the world, and by change the world I mean things like discover life on other planets or cure cancer. It is even more provocative to consider that most of these nascent accomplishments were not that hard. Rather than coming from brute force of mind, they came from unencumbered creative thinking, an environment supportive of trial and error, and steady efforts in a collegial team environment. On balance the visit was more empowering than daunting. This is where the connection to wellness becomes evident. I have written before about the connection between wellness and creativity. I have also written about the connection between learning and wellness. There is clearly a connection between wellness and altruism. I write now to encourage all of us to have a little more faith, a little more creativity, maybe some continuing education, maybe a little travel to get us out of our own heads, and more drive to make the world a better place. Get your nerd on people. I'm a perpetual student. You may not realize it but in certain circles this was considered an insult. I now realize it is good thing. Indeed life long learning is the only way to go. I have already blogged about the importance of reading and creativity. Those of you who know me realize I have a number of serious creative pursuits, Since we are approaching Halloween, I am deep in preparation to sew a detailed costume. For these sorts of things as well as my work, I have to study. That's right, study. For my costume I have had to research everything from specialized sewing machine feet to the thermal properties of craft foam. For my amateur photography I have had to research telescope eyepieces and how to connect a old school serial port to a USB port. Tonight for example I am deep into my annual board review preparation. Every year we have to review research articles and take tests, But every 10 years or so we have to take a big test and that is what I am preparing for this week. Additionally, I am aware of many of my friends and their adjustment to the new school year. Bottom line: all parents home school, even those parents whose kids go to public or private school. That's how I felt anyway when my kids were in grade school and high school. Every day when I would come home from work I would simply change hats and I would turn from OB/GYN to homeschool teacher. I would check in with each of my kids to see what they had to do for homework and upcoming tests. I would check in on how their classes were going. I might take a some time and give them a little supplemental information on a topic if I happened to know something about it. Finally I would monitor their study habits. As much as I think they found it irksome, I think even they would admit it has served them well. So what are good study habits? There are numerous books written on the subject which are beyond the scope of this blog post and well worth reading. I just want to emphasize that you should stay intellectually and creatively active as a part of your overall good health. I also want to empower you to get involved in your children's academic life. So here are a few basic tips for studying that will serve you as a parent coaching children, a student, or simply as an adult keeping her intellectual and creative life healthy. Get an overview of the task at hand. Even grade school children should know that school goes in semesters or quarters. They should know when the tests and quizzes are given, and when their assignments are due. Both children and adults should have a simple clear system for writing this down. It can be either digital or paper. Their should be a daily and weekly routine for referring back to this schedule. That makes for no surprises and less procrastination. Prepare. It does not matter whether you are preparing for a book report in seventh grade or a board exam when you are a doctor, preparation is key. Learn to channel your anxiety and concern into an early jump start on your project. This is imperative because it alleviates stress and gets the job done. Know how to study. Here is a general method for low stress, effective preparation. Scan the material for an overview. Make your own handwritten notes from your highlights. Make index cards from your handwritten notes, using a brief description on one side and more complete details on the other. Quiz yourself on your index cards. Do it out loud. When you do, put the ones you know well in one pile and the ones you need to review in another pile. Repeat your index card quiz, this time only with the pile that you need to review. Again, put the ones you fully understand in the good pile and the ones you need to review in the bad pile. Repeat the process until there is nothing in your bad pile. It turns out that getting as many senses involved in your learning helps. The technique described above involves several senses, sight, touch, and hearing. Reading, writing with your own hand, and seeing what your own hand has written or hearing yourself read what you're own hand has written reinforces the learning of information on multiple levels, indeed in multiple areas of brain. This is all well and good if you simply need to learn facts. However, if you need to know how to work problems, that comes next. Work on all the problems you can two or three days before they are due. That way you have a chance to go in and ask questions well before the problems need to be turned in. If you are a parent supervising children with homework like this, be sure that they do their assignments at least two days before they are due. You will ingrain this kind of habit in them for the rest of their life, and that will serve them well. And don't forget to lead by example. If you're working with older children who will be taking tests, coach them a little bit in test preparation. Emphasize early and repeated contact with material as well as working of every problem that the teacher has handed out. Encourage students to use practice tests that have been provided to them and that are available on the Internet. Encourage them to fill in their understanding with information they find on reputable Internet sites such as Khan Academy. Have them try finishing the test preparation the day before the test is given so that they can spend that day asking the remaining questions. Tell them not to be afraid of being like Hermione Granger and having their hand in the air all the time. Make sure you and your children have a good night’s rest before any tests. I realize this is easier said than done but it is sound advice. In fact, make sure they are well rested before any school day. This will maximize their ability to learn. Equally important is a good protein rich breakfast, especially before tests. It is important that if you are parents supervising children in their studying or their homework that you be supportive not harsh. Regardless of what you may think of their teachers, encourage courtesy toward the teacher. To do otherwise is a disservice to your child. Is very important to remember that if you are helping someone with their work, you're principally helping them to understand how to do the work themself. Under no circumstances do you do the work for them. You may work a similar problem for them to see, since that is different. A healthy creative and intellectual life has been proven to benefit health. This is true for both adults and children. I hope these tips help make your studies easy and fun.